It’s an Easter egg hunt of an entirely new brand: guess the country of inspiration! When I was describing my idea for three variations on deviled eggs, it occurred to me that I was pinning three East Asian cuisines to each version: China for the one with five-spice and scallions, Japan for the one with wasabi mayonnaise, and Thailand for the red curry and lime juice one. “Are you going to stick flags in them?” my friend asked, nonchalantly. Nah, I thought. I just wanted people to eat them, not pledge allegiance to them. Hopefully, they’d be able to admire their beauty as well. Well, that plan took an interesting turn early on. 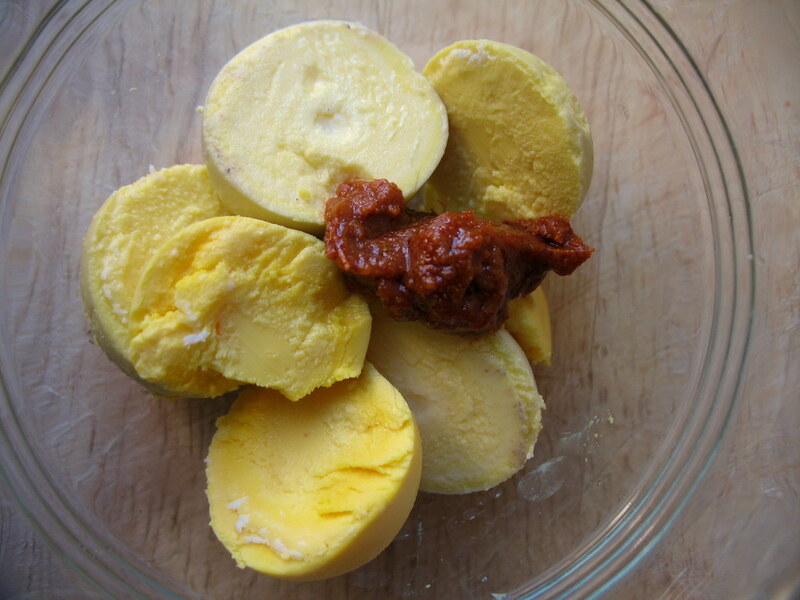 My deviled eggs-periment began with hard-boiling some eggs, which I planned to dye once peeled. Those “some eggs” I’d gotten from Queens County Farm Museum, and I was told by the farmer that they were actually collected from the coop that very morning. So they were not only very fresh, but very, very fresh. That’s good, right? Turns out, in every case except peeling them hard-boiled. After mutilating the surface of the first egg I tried to peel (using all the cues in the book — peeling it under water, carefully trying to lift the shell along with the elastic membrane away from the silken white), I knew there had to be something wrong. A quick Google search reported that fresh eggs are “almost impossible” to peel. 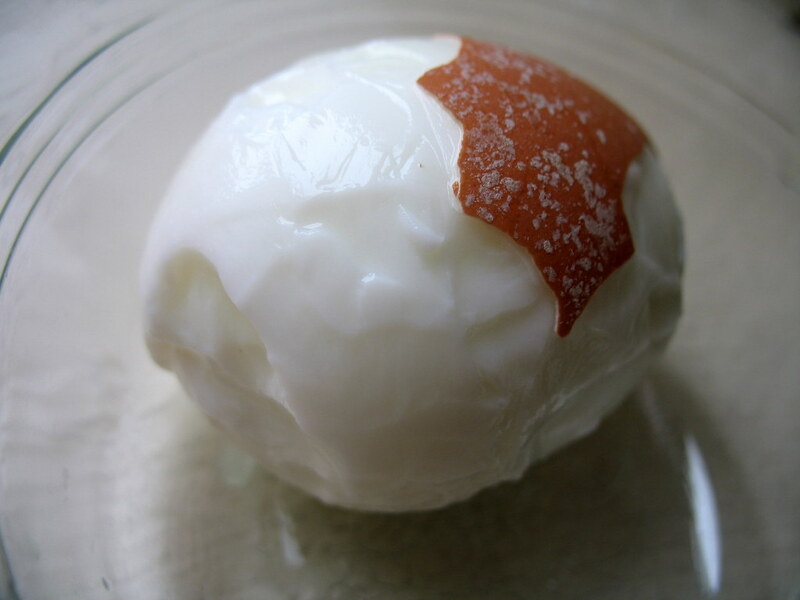 This is due to the acidity level in very fresh eggs that causes the thin skin of membrane to cling to the thin albumen layer of the egg white (check out a cross-diagram of an egg here — and I’d thought eggs were only whites and yolks!). Moreover, after a couple days in the refrigerator, the egg shrinks away from the shell a bit. After more searching, I was able to find discussions on this peculiar problem with very fresh eggs from various blogs and forums. Many of them pointed to Julia Child’s recipe for “The Perfect Hard-Boiled Egg” from her book The Way to Cook, which involves transferring the eggs from boiling water to an ice bath a few times. So for the final two eggs in my dozen (the rest were boiled already and so were beyond hope), I followed the instructions. And lo and behold, the shell peeled beautifully. 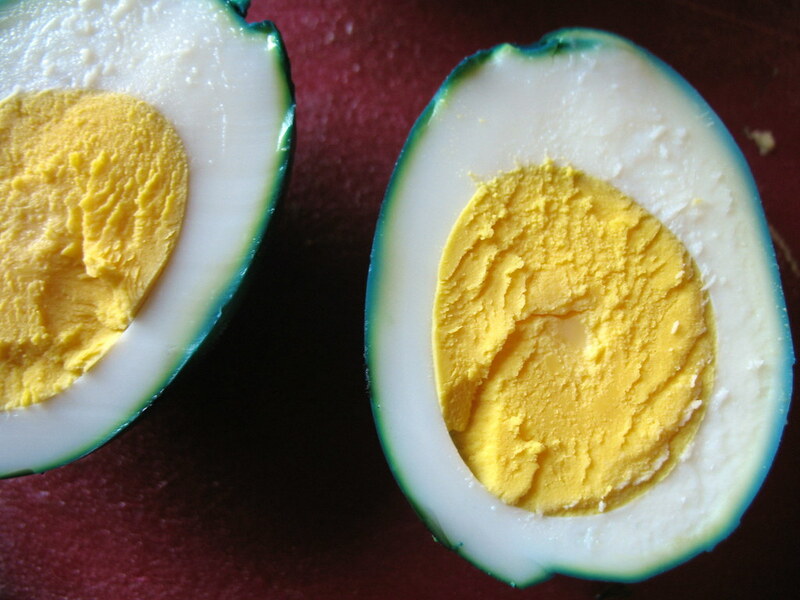 can you guess which egg was boiled “perfectly”? I feel oddly privileged to have experienced this aggravating kitchen dilemma. How often does a person who lives in NYC encounter eggs that are too fresh for their own good? With today’s global market, it’s wild to find ones that were just laid unless you raised the chickens yourself — or even some under a week old. Of course, that wasn’t always the case, and so that’s why I was able to find some cooking wisdom for really fresh eggs, from none other than the master herself. Onto the next step, dying the eggs, Easter-style. Well, almost. I wanted the peeled eggs to be colorful, since I’d be serving them deviled. Trusting the measurements on the side of my box of food coloring, I added plenty of drops of color to each half-cup of liquid in order to make what I thought would be pretty pastel purple, teal, orange and yellow-green. I guess they were thinking of shell-on eggs, only. Because my eggs were a shock of midnight violet, deep-sea green, neon superorange, and emerald city in about a half hour. I can’t say that wasn’t a fun lesson to learn as well. 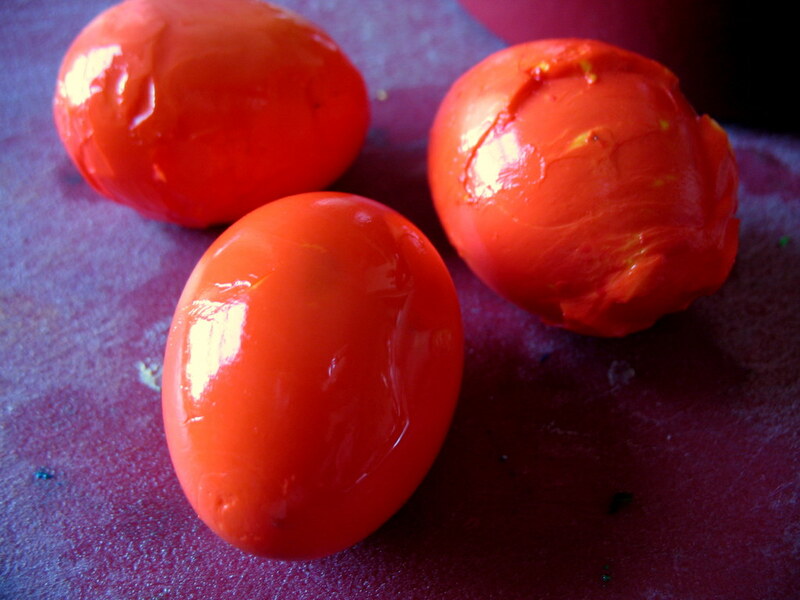 At least the dye didn’t penetrate the whites (sorry, first and second albumens) to stain the yolks, which would have been a deviled egg disaster. Finally, to “deviling” the eggs: removing the yolks and mashing them up with seasoning and mayonnaise. In retrospect, these fresh, cage-free eggs are probably best suited to eating alone, with minimal fuss and flavoring. They’re rich and fairly flavorful on their own. 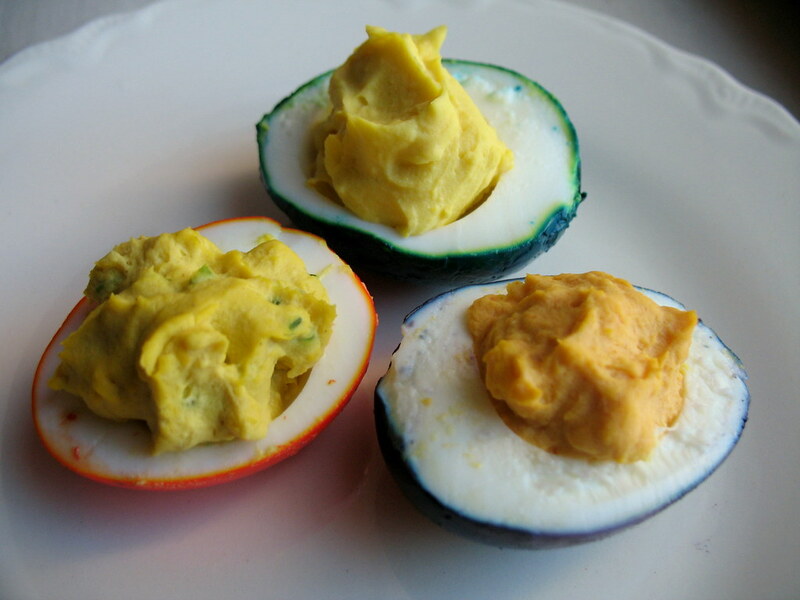 But for deviled eggs — any eggs — I thought these three variations were a bit of refreshing fun. My favorite one? 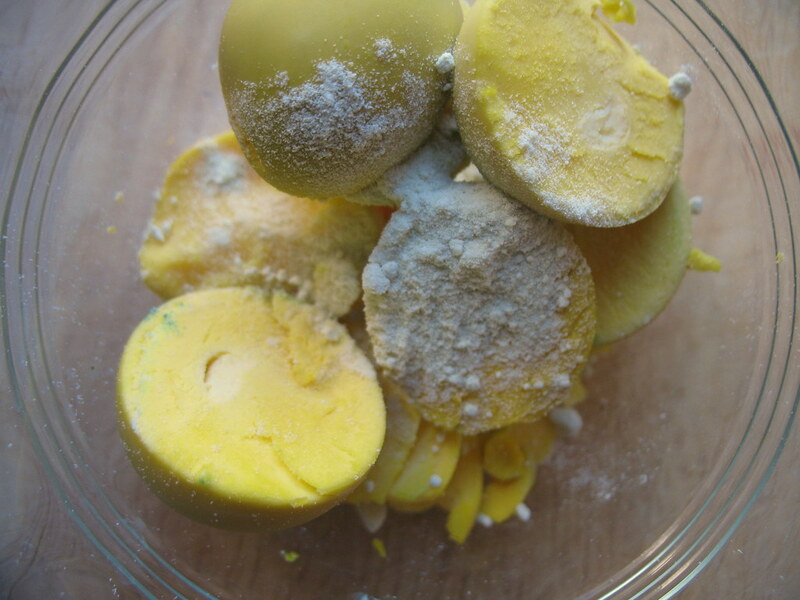 Blend yolks with the rest of the ingredients. Fill in egg white halves. 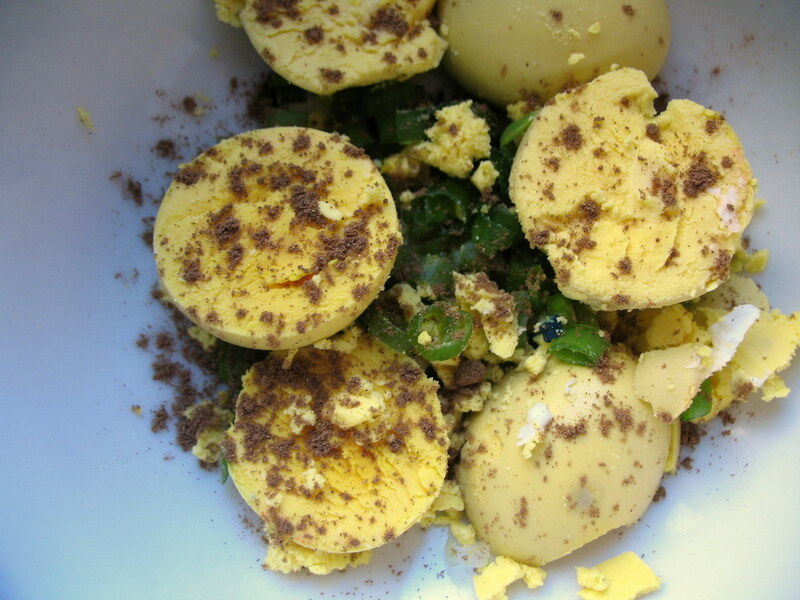 Blend yolks with the rest of the ingredients, saving some of the scallion/chives for garnishing on top (optional). Fill in egg white halves. Six brownie points: I don’t assume that a person eats six or seven deviled eggs in one sitting. These are hors d’oeuvres, rich, tasty bites, and as far as this type of food goes, deviled eggs are in pretty good standing healthwise. The yolks are bolstered in cholesterol count by mayonnaise (I used “lite” mayonnaise), but they give you a bite of protein, too. I can’t say much for the pinches and spoonfuls of spices in these recipes having any significance here. 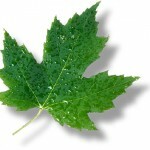 Eight maple leaves: So I didn’t make the mayonnaise myself. Coulda, and woulda been more green-friendly, given the plastic bottle waste, etc. But aside from that this recipe’s mainly eggs, and the eggs again were hatched at a nearby farm, from cage-free hens. I’ve noticed this problem even with grocery store bought eggs and tend to keep a few around until their expiration date to boil to get them to peel properly. I’ll have to try the ice bath method. The caged eggs will be fresher than the smaller caged free operations since they must wait usually to get enough eggs together to economically deliver them to a grocery store,unlike the caged operations who literally deliver them the same day or 1 day later of lay. refer to http://www.eggs.org for info on hard cooking eggs. Best way is to leave the eggs out of the refrigerator for a day and allow the membrane to shrink a bit. I’ve had the same problem too, glad I’m not the only one! Mine were just-purchased grocery store eggs, and I found that the ice bath plus peeling under water gave the best results, though I still had more trouble than with older eggs. Also, I love your egg variations, and I think the neon colors are actually kind of fun and festive! 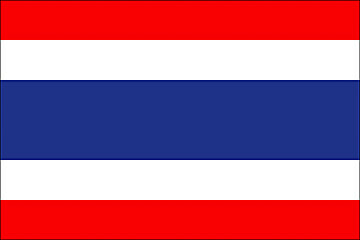 I might try the Thai version for myself, I wonder if you could work coconut in there somehow – maybe the thicker part of the milk could replace some or all of the mayo. If I experiment I’ll report back! ooh, deviled eggs! this reminds me of the Roy G. Biv deviled eggs from the second episode of Food Party. of course i doubt Cathy will be using Easy Cheese anytime soon..
It’s unfortunate that fresh eggs don’t peel neatly – ok, when you don’t need to serve them whole, but not for making devilled eggs, I’m afraid. And those eggs look way too colourful for me – I’d be weary to eat anything as bright (unless they’re naturally dyed, say with beet juice or turmeric). 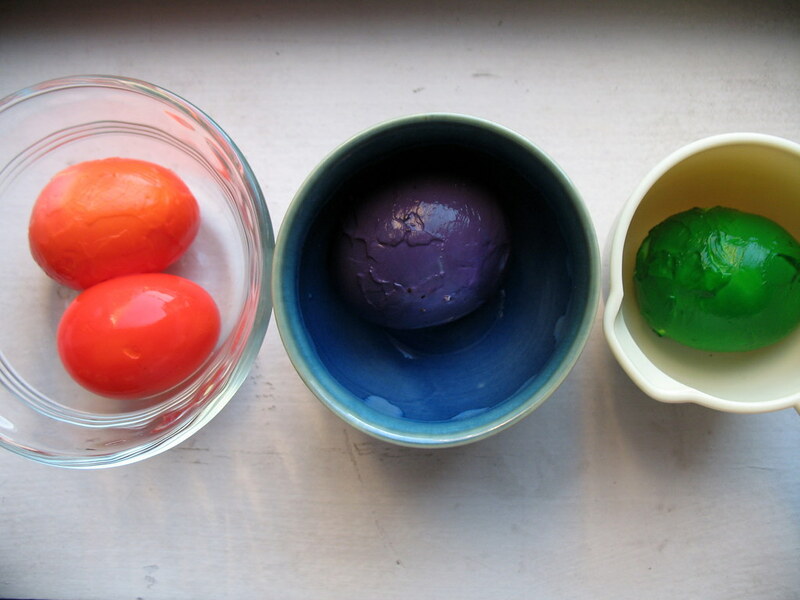 I didn’t even know you can dye eggs themselves with food dye (and not just unpeeled eggs). lol, I never knew there would be a problem with too fresh eggs! here in singapore, I have the opposite problem. they don’t store their eggs in the fridge, so they never are fresh when I buy them! Love it! Just found your blog and could not be more amused or grateful. I am crossing the divide from the world of unconscious,processed food consumption to all fresh, made at home foods (soy allergy). Your site is very helpful! I live in Nashville, where getting one’s own deviled egg tray is a right of passage. A variation on the standard Southern style (pickle juice, mayo, salt & pepper) could warrant expulsion from the proper circles:) Can’t wait to serve them! of this article, while I am also zealous of getting knowledge.